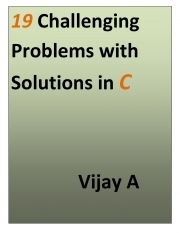 Description of "19 Challenging Problems with Solutions in C (eBook)"
This book puts together some inspiring and challenging programming problems with solutions in C. The programs include code for unix utilities like tr, uniq, conversion to roman numberals, computing molecular wt from a given chemical formula among other. Also include some K&R classics solved with a binary trees. Wish you all best for your code study !! Vijay is an MTech in computer science with over 10 years of experiencs hands on in C/C++. His interests are telecom, ontology based search engines and parallel programming. Reviews of "19 Challenging Problems with Solutions in C (eBook)"
Books with solutions to interesting programming problems are hard to come by. I liked the problem collection in this book and am sure it will be a good study for beginners and intermediate C programmers. Students of computer science can use this book along side K&R for developing an all round code study. It is meant for self study and as Vijay mentions in his book attempt the problems before actually seeing the solution. The zillion books in the market like 500 Interview questions to ace the technical interview .. made it look like the only thing we are ever concerned about is clearing the interview and getting a job. The programs in most programming books here never had any quality to it and the quality of the solutions abysmal to say the least. Are we ever going to reach the K&R standard or is the great Indian programming talent just a myth we convince ourselves and our clients abroad to keep the green buck flowing. For a refreshing change there is now a book with actual focus on problems and creative solutions. I will tell you from my experience Vijay has managed to come up with a wonder of a collection. Of course some of them are just beginner programs but the solution to even these problems have a professional bend. The solution to the 'uniq' command in unix which prints out only the unique lines in a list of lines is a marvel and he has come up with a amalgam of linked list and tree at the same time to achieve a very elegant data structure to solve the problem. Vijay was my colleague for 4 years post fresher days. Most of us learnt C/C++ programming working with him. I can safely say many top C programmer in our firm owe our careers to him. We all feel there is a lack of industry strength examples in the books we purchase and learn C. The same old calculator program, contrived dog and cat programs, various combinations of printf and scanf problems and you know what else. It is time beginners start to see elegant solutions to non-trivial problems early on in their programming life instead of wasting time with a 100 books on IF and WHILE. 19 challenging problems does not disappoint, with crystal clear solutions to many existing utilities like the tr and uniq command of unix also with excellent solution to 2 K&R classics. But I think the Molecular formula program is the icing on the cake, the parsing is really beautiful that program alone is worth all your investment. Not that the book is without drawbacks, the lack of explanations for some of the code is a minus making it slightly inaccessible to the beginner. I kidded him for that when he sent it for peer review, he is notorious for not having comments in his code. This is not a book that spoon feeds programming, if you are ready to turn the lights on, work late nights work with the code in the book, it will launch you where very few contemporary books will. And yes no amount of Internet search is going to yield you this much of condensed quality code. It is a programmer book written for programmers so syntax and techniques guys take a hike solving problems is an entirely different ball game as 19 Challenging Problems shows you.